My son and I just got the new Mario Kart 8 the other day (honestly I couldn’t tell you who was more excited about this game coming out, him or me!) , so expect so more Mario themed cartoons 😉 I should have planned this better and done an actual Mario Kart joke for this week and if fact I did think of one during the week, oh well. 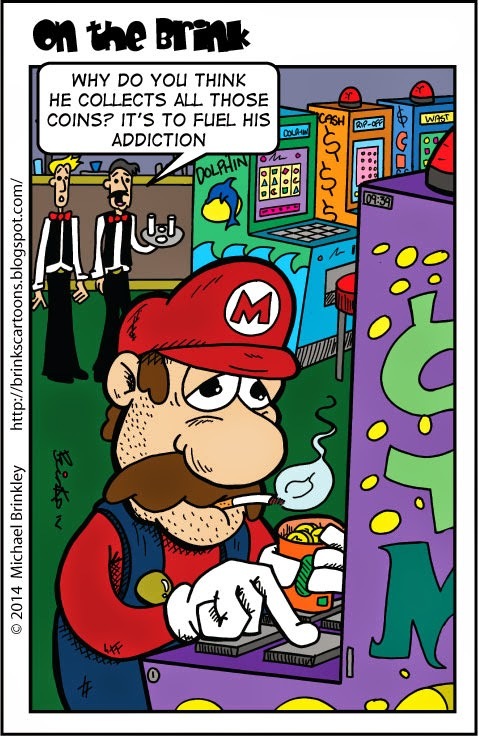 So maybe there might be another Mario cartoon next week, maybe….In all seriousness, what the hell does Mario do with all those coins he collects anyway? My current quest to revisit and revise my drawing methods and equipment continues this week, this cartoon was drawn on some new paper I’m trailing. It’s photo paper, which is the paper that’s designed to print out photos on and it’d awesome! Although I’ve found that some pens don’t work on it as well as others, but the ink is vibrant, dark, dries almost instantly and doesn’t bleed at all. It’s a lot more glossy than the paper I used to use and I’ve also stopped tracing onto the paper with a non-photo blue pencil as this paper doesn’t hold pencil very well, but I found that gives me a cleaner image anyway. The best bit is that I’ve found a supply of old ‘clearance’ stock of this paper cheap at 2 different shops, so I stocked up. Once again I’m planning on typing up and showing my experimenting in a post soon, speaking of which, I hate to jinx it, but it looks like my brand new Blog site may be up and running soon! So excited, I’ll keep you posted.